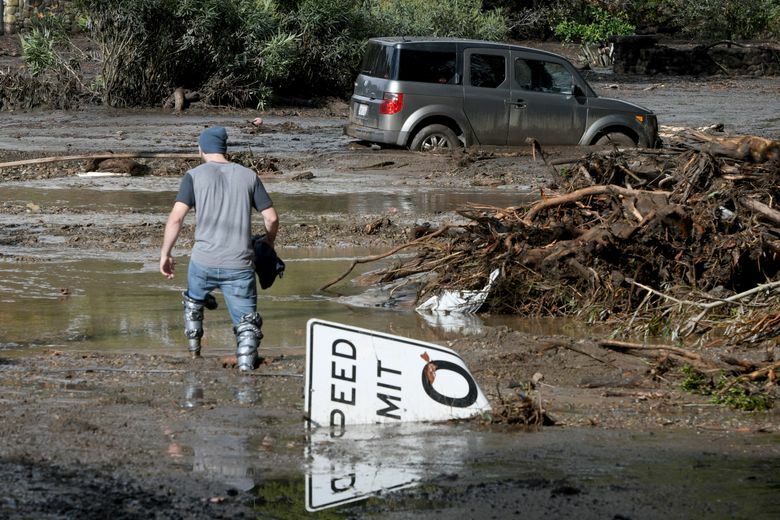 The same Californians who had to flee from huge wildfires in recent months now have to handle hard rains that bring another type of danger: mudslides. 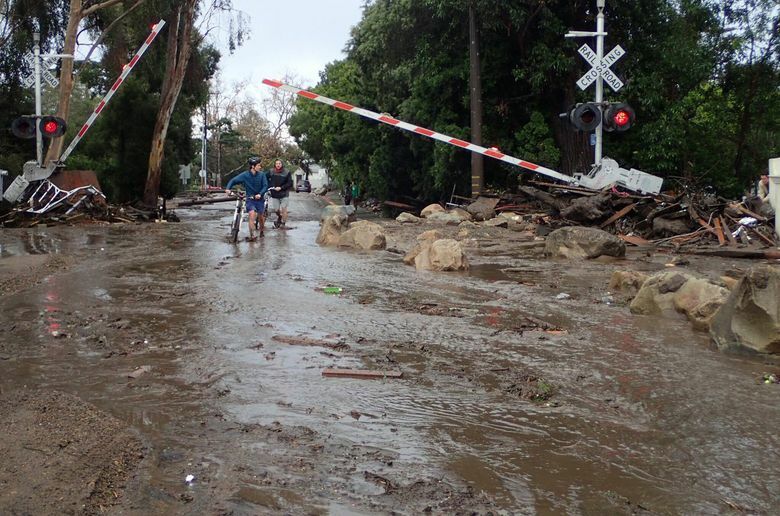 MONTECITO, Calif. (AP) — At least 13 people were killed and dozens of homes were swept away or heavily damaged Tuesday as downpours sent mud and boulders roaring down hills stripped of vegetation by a gigantic wildfire that raged in Southern California last month. 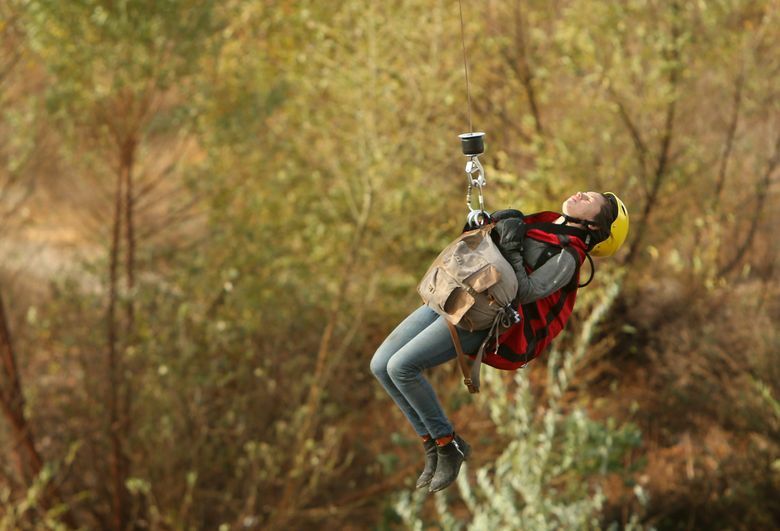 Helicopters were used to pluck more than 50 people from rooftops because downed trees and power lines blocked roads, and dozens more were rescued on the ground, including a mud-caked 14-year-old girl pulled from a collapsed Montecito home where she had been trapped for hours. 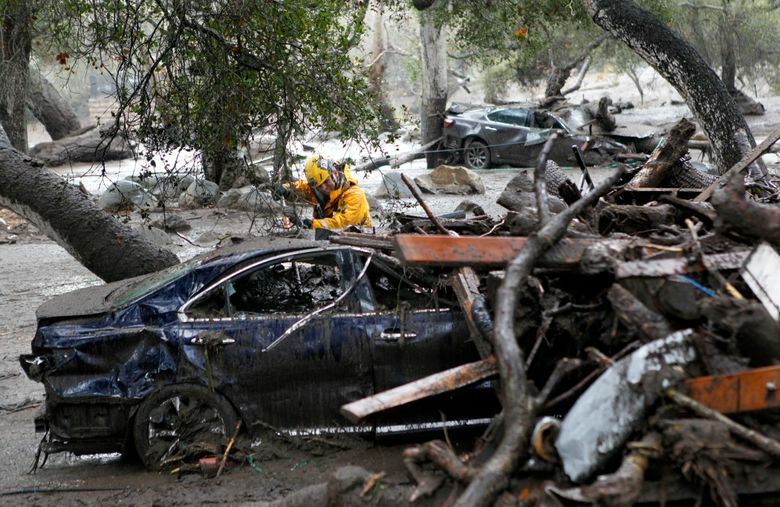 Most deaths were believed to have occurred in Montecito, a wealthy enclave of about 9,000 people northwest of Los Angeles that is home to such celebrities as Oprah Winfrey, Rob Lowe and Ellen DeGeneres, said Santa Barbara County spokesman David Villalobos. Twenty people were hospitalized and four were described as “severely critical” by Dr. Brett Wilson of Santa Barbara Cottage Hospital. An unknown number were unaccounted for and authorities were trying to determine if they were missing or just hadn’t contacted family members. The search for survivors continued into the evening, though Wilson noted that their conditions would deteriorate if they got wet. 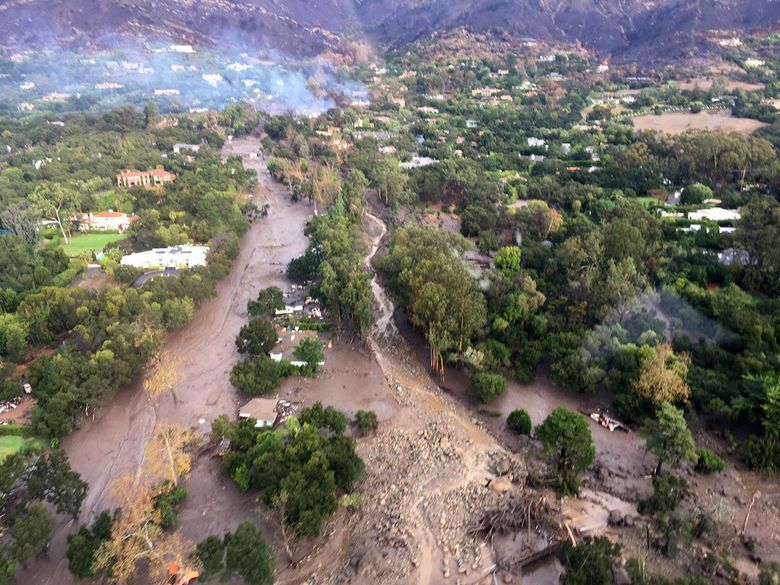 The mud was unleashed in the dead of night by flash flooding in the steep, fire-scarred Santa Ynez Mountains. Burned-over zones are especially susceptible to destructive mudslides because scorched earth doesn’t absorb water well and the land is easily eroded when there are no shrubs. 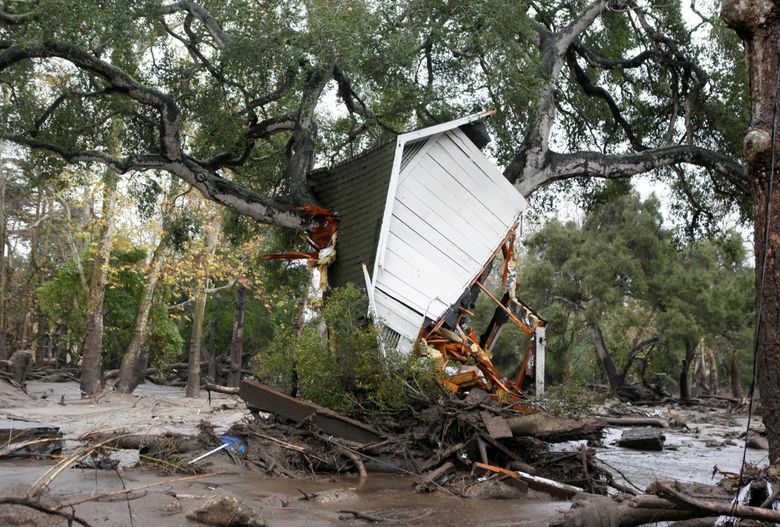 The torrent arrived suddenly and with a sound some likened to a freight train as water carrying rocks and trees washed away cars and trashed homes, smashing some into piles of lumber and filling others waist-deep in mud. Authorities had been bracing for the possibility of catastrophic flooding because of heavy rain in the forecast for the first time in 10 months. Evacuations were ordered beneath recently burned areas of Santa Barbara, Ventura and Los Angeles counties. 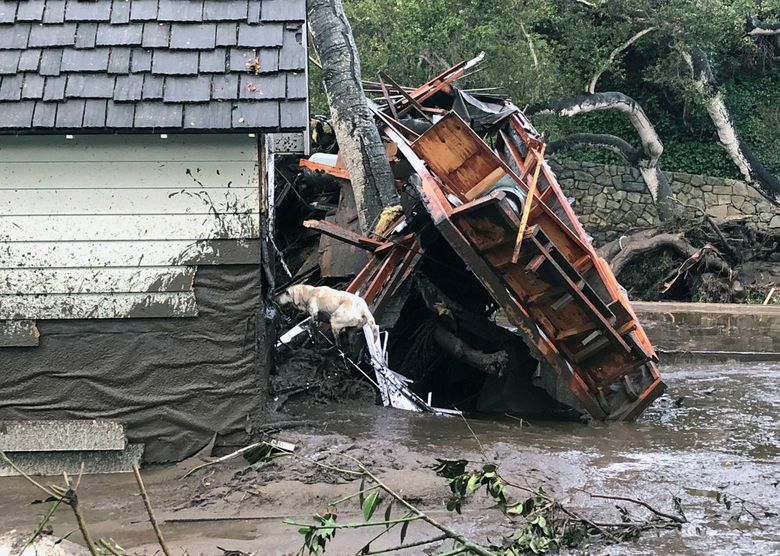 But only an estimated 10 to 15 percent of people in a mandatory evacuation area of Santa Barbara County heeded the warning, authorities said. The pair had left their house before it was inundated with 6 feet (1.8 meters) of mud, but they got trapped outside in the deep sludge and were shivering from the cold. 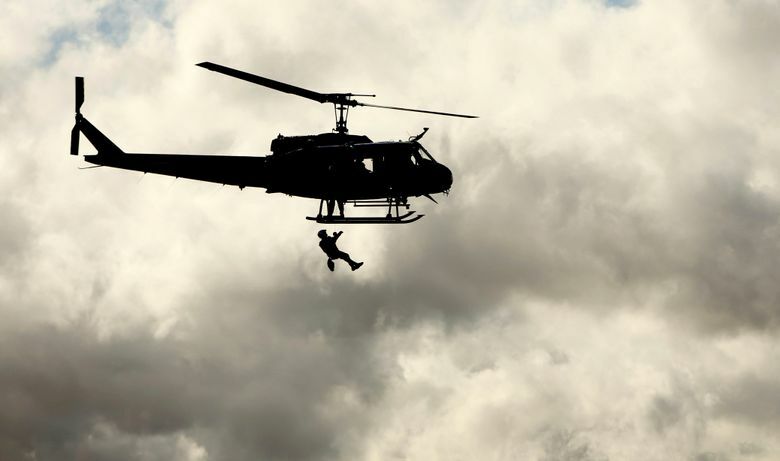 “It was sobering,” Miller said. The path of the deluge was graphically illustrated on the front of a white colonial-style house, where a dark gray stain created a wavy pattern running the length of the house halfway up the front windows. 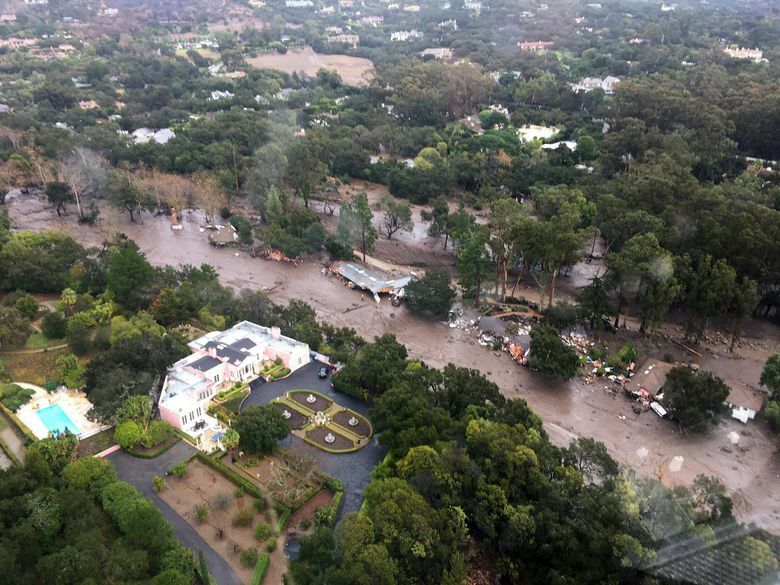 Aerial footage above Montecito showed what appeared to be a muddy river flowing through town. 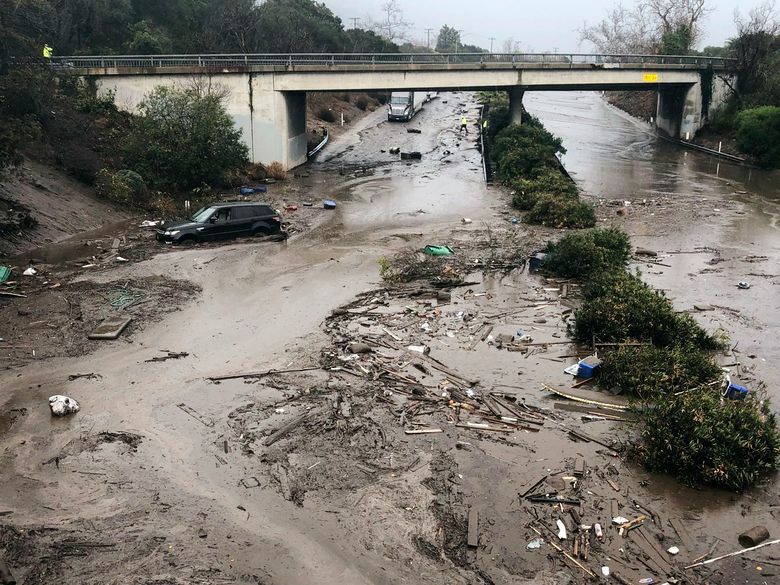 In fact, it was U.S. Highway 101, the link connecting Ventura and Santa Barbara, covered with trees and other debris and expected to be closed for two days. 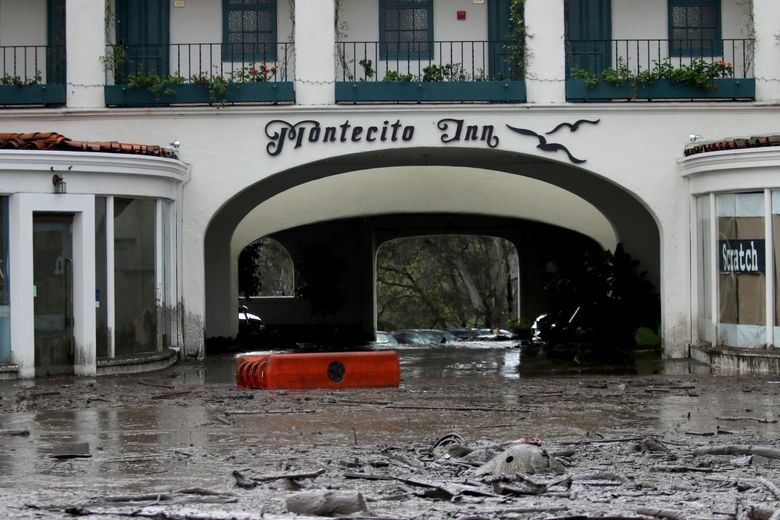 Some of the worst damage was on Montecito’s Hot Springs Road, where the unidentified girl was rescued and residents had been under a voluntary evacuation warning. Large boulders were washed out of a previously dry creek bed and scattered across the road. 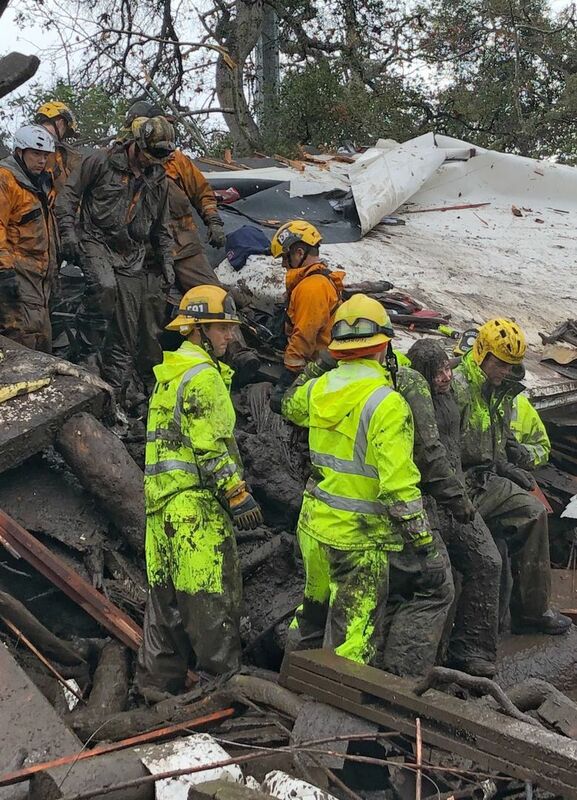 A rescuer working with a search dog walked among the ruins of a house as the yellow Labrador wagged its tail and scrambled into a destroyed building, looking for anyone trapped inside. Its belly and paws were black from the mud. 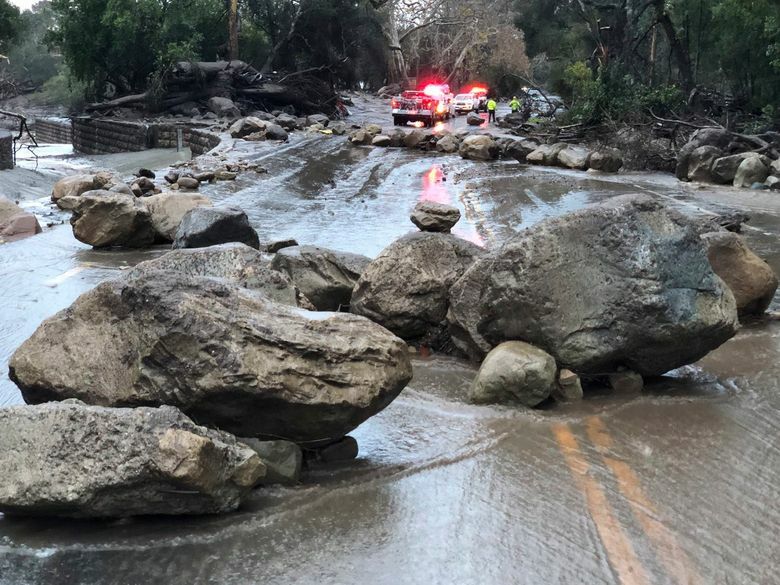 The worst of the rainfall occurred in a 15-minute span starting at 3:30 a.m. Montecito got more than a half-inch in five minutes, while Carpinteria received nearly an inch in 15 minutes. “All hell broke loose,” said Peter Hartmann, a dentist who moonlights as a news photographer for the local website Noozhawk. Hartmann said he found a tennis trophy awarded in 1991 to a father-son team his wife knows. “Both of them were caught in the flood. Son’s in the hospital, dad hasn’t been found yet,” he said, declining to name them. The first confirmed death was Roy Rohter, a former real estate broker who founded St. Augustine Academy in Ventura. The Catholic school’s headmaster, Michael Van Hecke, announced the death and said Rohter’s wife was injured by the mudslide. Montecito is beneath the scar left by a wildfire that erupted Dec. 4 and became the largest ever recorded in California. It spread over more than 440 square miles (1,140 square kilometers) and destroyed 1,063 homes and other structures. It continues to smolder deep in the wilderness. The storm walloped much of the state with damaging winds and thunderstorms and dumped up to 18 inches (45 centimeters) of snow in the Sierra Nevada. 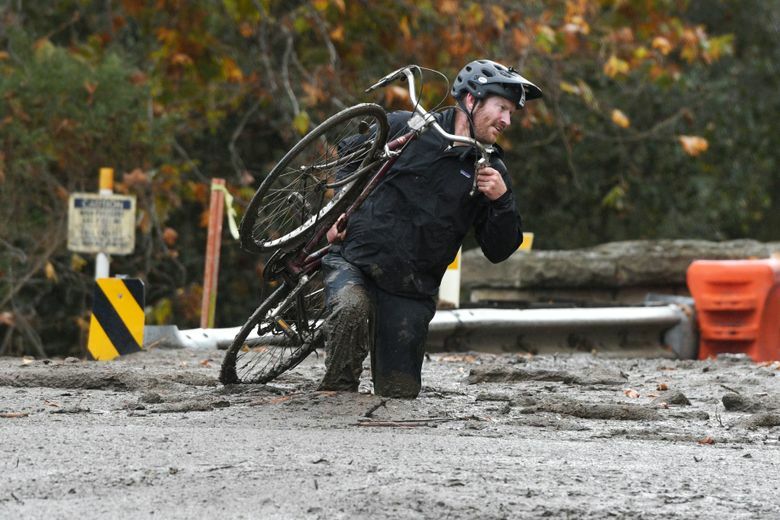 Downtown San Francisco got a record 3.15 inches (8 centimeters) of rain on Monday, smashing the old mark of 2.36 inches (6 centimeters) set in 1872. Weber reported from Los Angeles. Associated Press writers John Antczak, Michael Balsamo and Brian Melley in Los Angeles and Alina Hartounian in Phoenix contributed to this report.